For those of you who haven’t heard, there’s a new league called the BIG3 that has recently emerged. According to their website, the BIG3 is the American 3 on 3 professional basketball league. Formed by Ice Cube, the BIG3 combines superstar players and fan interaction before and after the games. The league is operated and managed solely by the players, and no outsiders are allowed. The game is structured half court style to encourage competition and intensity. This style of play is what is most used for training and practice, and the BIG3 believes it to be the most entertaining. The league states that their objective is to combine the energy and excitement of All-Star Weekend into a one day event as they travel around to different arenas around the United States. The league consists of 8 teams with 5 players each, and 1 coach per team. The regular season is 8 weeks long with one week of playoffs, and a final week for the championship match. This week, the league revealed the name and logo for their second team—Trilogy. 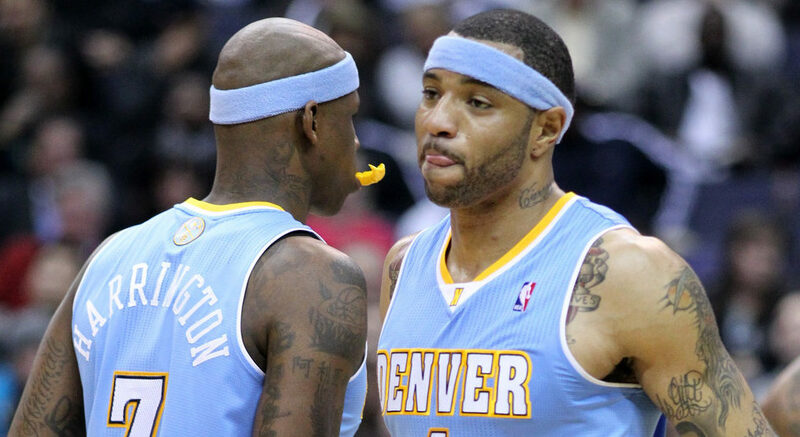 Kenyon Martin and Al Harrington have been named team captains, and these two will reunite after playing together on the 2010-2011 Denver Nuggets team. The BIG3 plans to host a combine and a draft where Martin and Harrington will select the remaining members of their team. NEW TEAM ALERT: TRILOGY Kenyon Martin and Al Harrington will reunite to lead new team TRILOGY in the #BIG3 BIG3.com for more details. Starting to get excited? I will go on to say (in my best infomercial voice) “but wait, there’s more!” Allen Iverson, Chauncey Billups, Jermaine O’Neal, Mike Bibby, Rashard Lewis, Jason Williams, Stephen Jackson, Bonzi Wells, Corey Maggette & Ricky Davis have also signed on as player captains in the league alongside Martin and Harrington. The player/coaches include Iverson, Clyde Drexler, Gary Payton, George Gervin, Rick Barry & Rick Mahorn. So here are the rules: All standard 2 and 3 point shots apply, but there are opportunities for a 4-point shot if the shooter is touching any part of the “4-point circle”. The league states that a shooting foul will be given the corresponding number of shots to the missed shot attempt—just like the NBA. However, this also applies to the 4-point shot. A free throw attempt will be added to any shot made where the shooter received a foul, so this means there will be opportunity for a five-point play. Any fouls that are incurred tally toward the team total, and no fouls will be assigned to the individual. This means no one can foul out. A technical foul will result in two shots and possession of the ball, but every technical foul after the first results in a total of four shots and possession. This could get interesting. The website also states that the first team to 60 points wins the game, but the winning team must win by 4 points. Halftime occurs when one team reaches 30 points. This could mean games are very short, or very long depending on the skill level of the players involved. The BIG3 also states that all defensive strategies are allowed which could mean some very interesting adaptations by the superstar lineups they have set to play. A player like Martin was known for being very aggressive so we could see some very entertaining and physical games. The league debuts this summer with opening weekend scheduled for Saturday June 24, 2017. The games will continue each Saturday for 10 weeks. There is no tip-off, but instead the game will start with a half-court “do-or-die” shootout. There will be 4 games each Saturday that will include fan events, halftime shows, exhibits and after parties. The BIG3 is the way to see your favorite retired NBA players back in action, and I will definitely be tuning in to see if the events live up to their hype.